Description: Not far from the city there is an ancient wood, forgotten by the modern world, where Mystery walks in the moonlight. He wears the shape of a stag, or a goat, or a horned man wearing a cloak of leaves. He is summoned by the music of the pipes or a fire of bones on Midsummer's Evening. He is chased by the hunt and shadowed by the wild girl. Greenmantle is not only a gripping thriller but also an introduction to the most profound philosophical issues in literature what stories are for and how they create us. …de Lint shows an awareness of what he's doing that makes his fiction not just a damn fine read but also a clear map of the road that fantasy follows through the human mind. 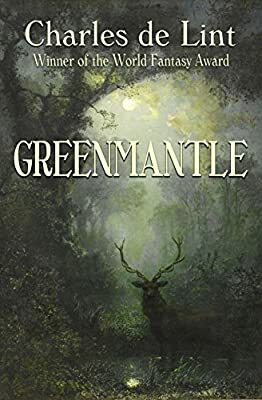 …with Greenmantle, he shows that, far from being mere escapism, contemporary fantasy can be the deep mythic literature of our time. Charles de Lint is one of my favorite fantasy writers. His juxtapositions of classical folklore with modern settings are full of power and beauty. His novel Greenmantle, is no exception: strong characters deal strongly with themselves and the supernatural. What is unique about this book is that the supernatural element is not the problem that most of the people are dealing with. It's an integral part of the story, but it is seldom threatening and it's generally beautiful. In most fantasies, the supernatural is the focus: here the focus is on people learning to stand their ground. Constructing a fantasy around the mythical figure of the horned god and interweaving it with a hard-hitting contemporary thriller is a nice idea in theory. In practice, when a story tries to cross genre boundaries or mix genre elements, it tends to lose its focus and fall into a vacuous no-man's land. Charles de Lint has succeeded magnificently where many have failed. Greenmantle fires on all cylinders and on all levels, especially in that difficult interstice between fantasy and reality. By turns poignant and upbeat, without being schmaltzy, this engrossing and pacy story will hold your attention from first to last and beyond guaranteed! Greenmantle sings to the intuitive mind with a clear, sublime and evocative sound. De Lint tells us that Greenmantle was partly inspired by Lord Dunsany's fantasy The Blessing of Pan. To my mind, de Lint's adaptation of this little known work represents the state-of-the-art of fantasy today. Greenmantle is made uncommonly vivid not only by a tightly wound plot, a modern-day setting, and a good number of well-drawn, sympathetic characters, but also by the author's rare ability to awaken in the reader a sense of knowledge and wonder about a level of latent reality that remains hidden or only half suspected. De Lint is a master of the modern urban folk tale. It is hard to imagine urban fantasy done better then it is by de Lint at his best. In de Lint's capable hands, modern fantasy becomes something other than escapism. It becomes folk song, the stuff of urban myth.